Four years later in Spain, one of the most controversial World Cup matches took place when West Germany played Austria in the ”Disgrace of Gijon.” Similar to earlier circumstances when Argentina routed Peru 6-0 to make it to the World Cup final, both teams took the field of play knowing the stakes. In the latter case, the two teams knew that a 1-0 win for West Germany would be enough for both to progress to the next round because they both had superior goal differences compared to Algeria, which had won its final group game against Chile the day before. After West Germany took an early lead through a goal by Horst Hrubesch, neither team did much to try to score the rest of the way. There were 40-yard back passes to the goalkeeper and endless passages of play involving sideward moves. The crowd, which included fans of Algeria, grew restless. The final minutes of the match were particularly drab. Though there is no indication that it was fixed, the match has gone down as one of the most cynical ever to be played. 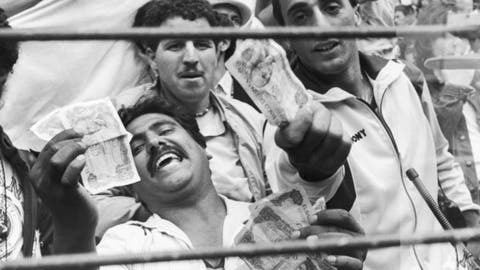 Algeria’s fans waved banknotes to illustrate their fury at what had taken place on the field. It prompted FIFA to change the rules. From 1986, the final group games would be played at the same time. Algeria met eventual world champion Germany in the round of 16 at the 2014 World Cup, and the memory of the ”Disgrace of Gijon” remained a motivation tool for coach Vahid Halilhodzic. ”Rigging kept us from going further,” Halilhodzic said ahead of the match, which Algeria narrowly lost 2-1.